The original NASA/ESA Hubble Space Telescope image of the famous Pillars of Creation was taken two decades ago and immediately became one of its most famous and evocative pictures. Since then, these billowing clouds, which extend over a few light-years, have awed scientists and the public alike. Most stars with masses similar to that of our Sun will end their lives as white dwarfs — small, very dense, and hot bodies that slowly cool down over billions of years. On the way to this final phase of their lives the stars throw their atmospheres out into the space and create planetary nebulae, colourful glowing clouds of gas surrounding the small, bright stellar relics. 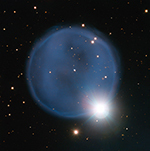 This image, captured by ESO’s Very Large Telescope (VLT), shows the remarkably round planetary nebula Abell 33, located roughly 2500 light-years from Earth. Being perfectly round is uncommon for these objects — usually something disturbs the symmetry and causes the planetary nebula to display irregular shapes. To celebrate its 24th year in orbit, the NASA/ESA Hubble Space Telescope has released a beautiful new image of part of NGC 2174, also known as the Monkey Head Nebula. This colourful region is filled with young stars embedded within bright wisps of cosmic gas and dust. NGC 2174 lies about 6400 light-years away in the constellation of Orion (The Hunter). Hubble previously viewed this part of the sky back in 2001, creating a stunning image released in 2011, and the space telescope has now revisited the region to celebrate its 24th year of operation. Nebulae are a favourite target for Hubble. Their colourful plumes of gas and fiery bright stars create ethereally beautiful pictures. Some of the most famous of Hubble’s images have been of nebulae — for example, the telescope’s 22nd and 23rd anniversary images of the Tarantula and Horsehead nebulae, and its festive 2012 image of planetary nebula NGC 5189. The detail shown in this image lies within NGC 2174, a nebula which gets its more common name, the Monkey Head Nebula, from its curiously familiar shape when viewed in wide-field images. Astronomers know that while large stars can end their lives as violently cataclysmic supernovae, smaller stars end up as planetary nebulae – colourful, glowing clouds of dust and gas. In recent decades these nebulae, once thought to be mostly spherical, have been observed to often emit powerful, bipolar jets of gas and dust. But how do spherical stars evolve to produce highly aspherical planetary nebulae? In a theoretical paper published this week in the Monthly Notices of the Royal Astronomical Society, a University of Rochester professor and his undergraduate student conclude that only “strongly interacting” binary stars – or a star and a massive planet – can feasibly give rise to these powerful jets. When these smaller stars run out of hydrogen to burn they begin to expand and become Asymptotic Giant Branch (AGB) stars. This phase in a star’s life lasts at most 100,000 years. At some point some of these AGB stars, which represent the distended last spherical stage in the lives of low mass stars, become “pre-planetary” nebula, which are aspherical. Two new views from NASA’s Nuclear Spectroscopic Telescope Array, or NuSTAR, showcase the telescope’s talent for spying objects near and far. One image shows the energized remains of a dead star, a structure nicknamed the “Hand of God” after its resemblance to a hand. Another image shows distant black holes buried in blankets of dust. “NuSTAR’s unique viewpoint, in seeing the highest-energy X-rays, is showing us well-studied objects and regions in a whole new light,” said Fiona Harrison, the mission’s principal investigator at the California Institute of Technology in Pasadena, Calif.
NuSTAR launched into space June 13, 2012, on a mission to explore the high-energy X-ray universe. It is observing black holes, dead and exploded stars and other extreme objects in our own Milky Way galaxy and beyond. The Tarantula Nebula is located in one of our closest galactic neighbours, the Large Magellanic Cloud. Hubble has released images of this celestial spider several times before: in 2004 (heic0416), 2010 (heic1008), 2011 (heic1105) and 2012 (heic1206). While these images show striking panoramic views of this turbulent region, this new image gives us the deepest and most detailed view yet. Created using observations taken as part of the Hubble Tarantula Treasury Project (HTTP), this image is composed of near-infrared observations from both Hubble’s Wide Field Camera 3 (WFC3) and Advanced Camera for Surveys (ACS). Due to the combination of infrared filters in this image a purple haze fills the frame, with deep red wisps of dust and bright stars scattered throughout. This festive NASA Hubble Space Telescope image resembles a holiday wreath made of sparkling lights. The bright southern hemisphere star RS Puppis, at the center of the image, is swaddled in a gossamer cocoon of reflective dust illuminated by the glittering star. The super star is ten times more massive than our sun and 200 times larger. RS Puppis rhythmically brightens and dims over a six-week cycle. It is one of the most luminous in the class of so-called Cepheid variable stars. Its average intrinsic brightness is 15,000 times greater than our sun’s luminosity. The nebula flickers in brightness as pulses of light from the Cepheid propagate outwards. Hubble took a series of photos of light flashes rippling across the nebula in a phenomenon known as a “light echo.” Even though light travels through space fast enough to span the gap between Earth and the moon in a little over a second, the nebula is so large that reflected light can actually be photographed traversing the nebula.